Roadblock cases generally have many defenses at trial, due to the context of the arrest and stop. But there are also certain LEGAL defenses that should be raised at trial as they can also result in the dismissal of a case. A DUI roadblock is when police officers stop every vehicle at a fixed point. After being stopped, an initial screening officer will approach your car and greet you. The greeting is supposed to be short and brief; so if it deviates from what is required by the State police plan, this could be a basis of having the charge dismissed at a motion to suppress hearing. There are a few physical indicators the officer is looking for when deciding where or not a driver should be sent to the pit area. While speaking to you, the officer is looking to see if your eyes are blood shot and glassy, if there is any odor of alcohol on your breath or any other signs of drunk driving such as open containers of alcohol. Often an officer will attempt to obtain admission of drinking. The initial Screening officer deviating from the State police plan in greeting you at the initial checkpoint. Not having reasonable suspicion to direct you from the follow of traffic. Not complying with all of the details required by the Courts in conducting a roadblock. Since a Roadblock is an extraordinary infringement upon the Constitution, being stopped for no reason at all, the police must comply strictly with the criteria set forth by the Massachusetts Supreme Judicial Court. This provides many legal defenses to your case. I was arrested at a MA Roadblock. What should I do now? If you have questions about this page or about your case call 781-686-5924 to schedule your free, no-obligation consulation with Attorney DelSignore. Check out these recommended pages from DelSignore Defense. Massachusetts DUI Roadblocks Common Throughout Holiday Season Roadblocks were a regular sight throughout Massachusetts over the holiday weekend – and they will continue to be through the end of the year. 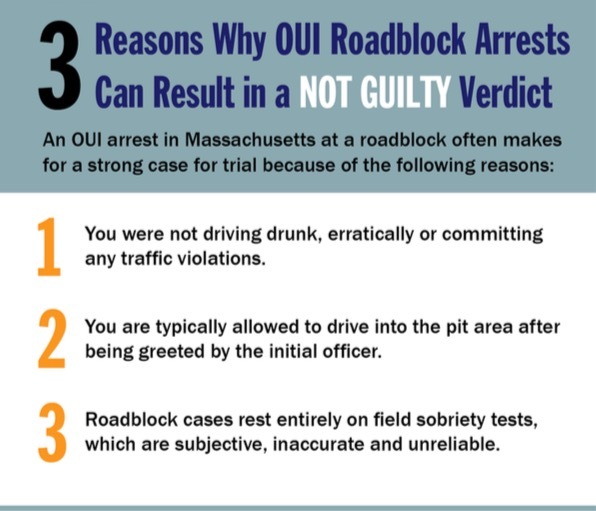 Click here to download a FREE copy of "Defenses to OUI Roadblock Arrests"